Marina Abramović studied painting in her hometown of Belgrade before realizing that her own body was the best medium for expressing herself. Today, she is best known for her performance art that pushes the boundaries of body and mind while challenging the perceptions and acceptance of the audience and public. They include her 1997 performance, Balkan Baroque, where Abramovic scrubbed 1,500 cow bones for six hours a day while singing lines from Balkan folk songs of her childhood. In 2002, she lived in full view of the public at New York’s Sean Kelly Gallery for The House with the Ocean View performance. Moving among the gallery’s three front rooms, she didn’t eat, speak, write, read or sleep for longer than seven hours a day. The only thing she did do was drink mineral water and take a shower three times a day. And Abramović’s most notorious performance was The Artist is Present that she presented at New York City’s Museum of Modern Art in 2010. From mid-March to the end of May of that year, she sat on a chair for 721 hours doing nothing other than maintaining eye contact with the 1565 visitors who lined up for hours to sit in front of the artist. Abramović has always generated criticism throughout her 40-year career, with people labeling her mad and in need of being institutionalized. Her career took a different turn more recently through collaborations such as the one with Lady Gaga, which introduced Abramović to a whole new audience. Predictably, she was then attacked for striking up a partnership with someone so mainstream. 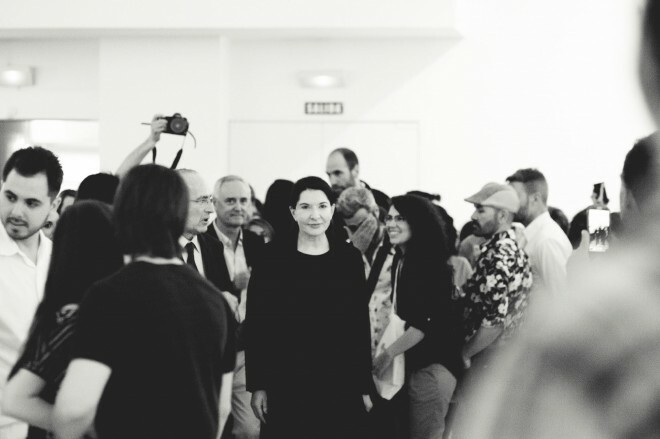 Critics say Abramović, who for years has preached the immateriality of her work, was selling out – using fame to enrich the Marina Abramović Institute that she is currently building up. But the performance artist, as usual, offers a different perspective.